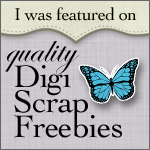 I'm here to show you my new kit, Mr. Mustache, and to give a mini-kit freebie + a discount for you! "I mustache you a question. Are you looking for a kit that is fun, charming, and awesome all wrapped into one? Well, this is the kit for you! It even has a touch of whimsy in there. This is perfect for adding a touch of whimsy and fun to your pages. Don't let the mustaches fool you! It is perfect for girl and boy pages." So, hurry up and grab yours, because it's only $4.23 until tomorrow! And the other good part of the post, the mini-kit freebie (this is the first and last time that i'll give you the newsletter freebie. LOL Sign up if you want the others....)!